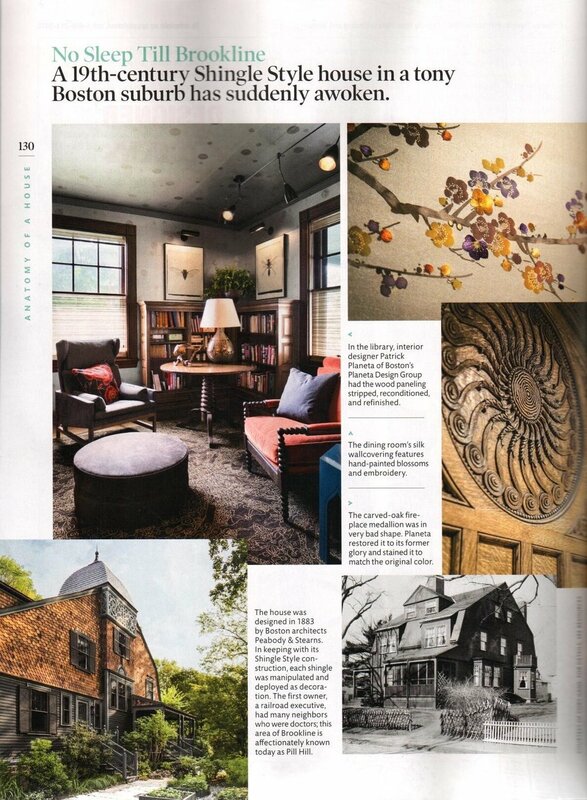 Our client, Copious Row, which recently opened at The Street in Chestnut Hill, was featured in the January issue of Boston magazine. Thank you Abby Bielagus for an amazing feature! Learn all about the incredible expansion design of our client, Business District, in the latest issue of The Improper Bostonian on stands now! Online story available here. It only makes sense that shopping for new luxury pieces for your closet should be, well, luxurious. Get ready to feel like a pampered princess browsing the racks at Copious Row, the new 2,400 square-foot boutique now open at The Street in Chestnut Hill. Designed by Zachary Dillingham Zimmerman, the interior features slabs of pink onyx and emerald green empress marble with handmade custom Apparatus Studio fixtures, Gabriel Scott pendants, and exclusive Fornasetti wallpaper that is not yet available in the states. Need to rest for a spell? Pull up a seat on one of the custom tweed Kelly Wearstler chairs! There’s a lot to take in. Although this is the brand’s third location, it’s the largest and the first to carry footwear. CEO and Creative Director, David Chines, opened the first store four years ago in Sag Harbor and has since opened locations in Southampton, New York and Greenwich, Connecticut. No stranger to the retail game, Chines worked in marketing, public relations and digital strategy for luxury conglomerate LVMH before deciding to launch Copious Row. Taking his knowledge and connections with him, he’s able to offer exclusively distributed labels, from recognized designers to emerging brands, some of whom were not available in Boston until now. So if you’re in need of some retail therapy but don’t actually need anything new, come have a look around. Guaranteed you leave feeling just a little more fabulous. Copious Row is located at The Street, 33 Boylston Street in Chestnut Hill and is open on Monday through Saturday from 10 a.m. to 7 p.m.and on Sunday from 12 p.m. to 6 p.m.
Our client, Patrick Planeta of Planeta Design Group, along with his dog Moses and partner Santiago Varela, were featured in the latest issue of Boston Common showcasing their philanthropic work. Gets your November issue out now! Thrilled to have our client, The Heritage On The Garden, featured in the latest episode of Boston’s Red Carpet on NESN with host, Tonya Mezrich. This episode featured the amazing fashions from this year’s From Fenway to the Runway event in support of the Red Sox Foundation. Thank you Exhale Spa, located at The Heritage, for hosting the Boston’s Red Carpet team to a wonderful afternoon! Be sure to check out the September/October 2018 issue of Artscope magazine to see our client, CambridgeSeven’s, full-page feature on their newest gallery exhibit “Visages de Punk” by JJ Gonson. Pick up the latest issue to learn more about the artist and the firm’s Curator, Kwesi Budu-Arthur! Visages de Punk is open to the public now through October 19. Excited for our client, Patrick Planeta of Planeta Design Group, for his 2-page spread and front cover shout out in the October issue of Elle Decor on stands now. Get yours! We are pleased to announce our principal, Lynne Kortenhaus, will be showcasing her work at The School House Gallery in Provincetown, MA on July 20 - August 8, with a celebratory reception on July 20th from 6-9 pm. Click here for more info! LYNNE KORTENHAUS was raised on a 26-acre New Jersey farm among makers—her grandfather cultivated the land and her grandmother and mother brought the fruits of his labor to the table daily. Early on, Lynne was influenced by this homesteading heritage. She used her grandmother’s Singer sewing machine to craft her own dresses from Vogue patterns, and learned the art of crochet. She took this joy of making to the Rhode Island School of Design where she earned a BFA in 1973 and an MFA in 1975. Lynne spent her final year studying drawing and printmaking in Florence, Italy. The technical, process-driven demands of printmaking satisfy her obsessive nature; she has been dedicated to refining her craft ever since. Lynne has always lived close to the sea—she has residences in Charlestown and Provincetown, MA, and Clearwater, FL—and her art is deeply influenced by the changing moods of the shoreline in every season. Wherever she travels, she photographs natural moments and uses these images to inspire her work. She is particularly drawn to the reflection of light on land and ocean, and the Atlantic coast’s ever-changing tides and dunes. Lynne is a passionate supporter of the fine arts community. She is a member of the Provincetown Art Association and Museum; a Director’s Circle member of the Institute of Contemporary Art; and a trustee of the Fine Arts Work Center in Provincetown. She is currently the chair of the Public Art Commission for the City of Boston. She is a contributing artist to the annual FAWC Monoprint Project, originally established by Michael Mazur and currently directed and curated by artist Bert Yarborough, and is a member of the Boston Printmakers.